I’m thrilled that my poem, “Redemption at Ray’s Corner Grocery Store” is part of the new online edition of World Literature Today! I am in great company for my work joins poems by Dorianne Laux, Joseph Millar, Jim Daniels and Sandee Gertz Umbach. See the special online section labeled 16 American Working-class Poets for some great work. Both the print edition and the online edition have been edited by poet and scholar Jeanetta Calhoun Mish who has also written a great article titled “Working at Getting the Word Out in America: Small Presses, Journals, and Websites Publishing Working-class Writing.” Stop by and read through the rest of the contents. October has started out on a high note — On Friday, October 4, I presented a brief poetry workshop to area high school teachers. When I say brief, I mean brief – the workshop was only about an hour and a half long. During the workshop, I talked about different forms of poetry including the pantoum, the ghazal, the sestina, and the villanelle. (I mentioned the sonnet — but since most people know of the sonnet, I didn’t want to dwell on Bill Shakespeare’s favorite form!). Then, I explained why I teach form in both my Writing About Literature and Creative Writing classes. I know that while many writers find writing within a specific form a bit stifling — students (such as many business, computer and engineering majors) are often relieved to find rules in place for poetry. They are happy that they don’t have to analyze all this “free verse jazz” as one of my students once called the open forms that many of us use in writing. This workshop also reminded me of some favorite contemporary poets who experiment with form including Aimee Nezhukumatathil, Shaindel Beers and Sandra Beasley. I really need to revisit their work more often. In other poetry news, I received two acceptances in the inbox this week, one for a poem and one for a poetry book review. Since both are online publications, I will post links when I know more. It’s just a bit nice to have a break in the rejection spell. In general, we are experiencing gorgeous Autumn weather — the kind that makes me happy that I’m living in western Pennsylvania. Thus, I am declaring a school free weekend. I will return to reading student papers on Monday. A few years ago, poet Helen Ruggieri posted a call for submissions for poetry that explored the landscape of and around the Allegheny River. I submitted a few poems and they were accepted. Then, a series of events occurred that stalled the publication of the anthology. For a long time, it didn’t seem like this project was going to make it to the page. But today, I’m happy to report that Helen’s persistence has paid off! 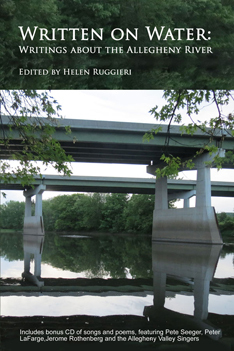 My poems join work by Julia Kasdorf, Phil Terman, and Maggie Anderson (among many others) in Written on Water: Writings about the Allegheny River, and while I have yet to see a hard copy, everything I have read through electronic versions looks wonderful. And the cover is beautiful! Written on Water: Writings about the Allegheny River is now available for preorder. Take a look at the homepage of Mayapple Press for more details. As for me, I can’t wait for my copy! I haven’t been home much in the last few days. Between spending long days in my office and traveling to Pittsburgh for some baseball game fun, I haven’t had a lot of time to get some of my personal projects completed. Deadlines are top priority this week. I have conference papers to finish, poems to revise, submissions to send, and at least one book review to write. As always, too much work, too little time. Good news of the week: I got an acceptance from Poetry East, one of my favorite literary journals! “Yellowjackets” will appear in the Fall 2013 issue. I have loved Poetry East forever, so I am especially excited about this publication.